The Police has arrested Mrs Jennifer Dikeocha (pictured above) for inflicting varying degrees of injury on her four-year-old step daughter, Stephanie, a pupil of Royal Peters International Academy, Mowe, close to Lagos. The suspect was said to have been arrested by police men from the Ogun State command on Friday, November 9, 2018. The teacher, whose name was not supplied by the police, said she had noticed the lacerations over time, adding that the girl was always weeping whenever the school closed for the day, probably due to the torment she will be going to face at home. The state Police PRO, Abimbola Oyeyemi, said the teacher explained to the police that the victim came to school on Friday sickly and when she tried to feel her body temperature, the girl recoiled in pain. The girl's mother was said to have died after given birth to Stephanie. “She said this prompted her to check her and found lacerations all over the girl’s body,” Oyeyemi added. He said the Divisional Police Officer in charge of Mowe Divisional Police Headquarters, Francis Ebhuoma, detailed detectives to follow the girl to the house where her stepmother was arrested. 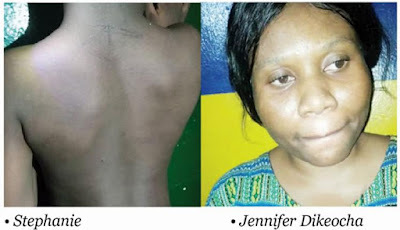 “The Abia State born woman told the police that the mother of the girl died while giving birth to her and that she (Jennifer) got married to the girl’s father in 2016,” the police spokesperson stated. Oyeyemi, a Deputy Superintendent of Police, said the stepmother could not adduce any reason for maltreating the girl. Meanwhile, the state Commissioner of Police, Ahmed Iliyasu, has ordered that the juvenile welfare section of the command should conduct a thorough investigation into the case.